By now, we all know what destruction the Spotted Lanternfly can bring to our agricultural commodities. So far, more than $20 million has been invested into the containment of SLF in PA, and the Pennsylvania Department of Agriculture (PDA), Penn State Cooperative Extension, and the United States Department of Agriculture (USDA) have created a taskforce that has undertaken concerted efforts to control this invasive species. So, what's everyone's role in this fight? What Happens After You Report a Sighting of SLF? The partnership is aware of infestation in the quarantine zone, but continued reporting allows us to track movement within the quarantine. So, if you're located inside area, start by visiting the Penn State Extension website. If you're located in the buffer zone, you can expect to be contacted by USDA. If you're located outside of the quarantine and buffer zones, you will be contacted by the PDA or USDA and a crew will be dispatched to investigate the area as soon as possible. PDA, USDA, and Penn State Extension are working hard to control this pest, but we can't do it without your help. By reporting any sightings, scraping egg masses, and controlling trees on your own property, we will be better positioned for future success. 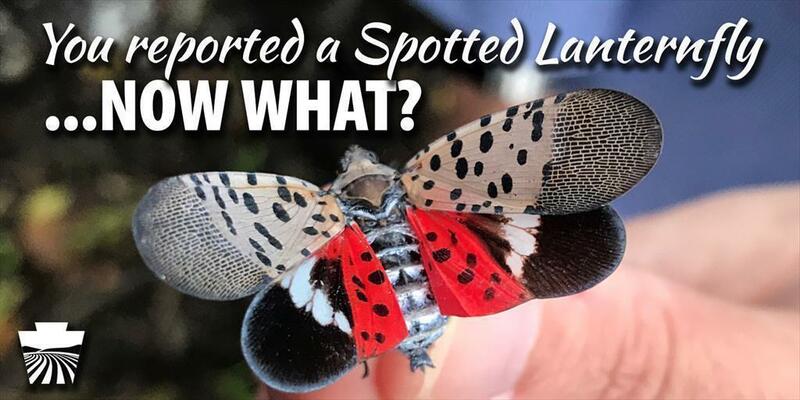 We encourage residents to report a sighting online at https://extension.psu.edu/spotted-lanternfly or by calling 1-888-4BAD-FLY. On this website, you will find information on how to manage this pest on your property or business.